If you are like me, when you apply your make up the goal is to achieve flawless skin. However, unless you have been blessed by the skincare gods your skin may not always look its best.T his is where colour correction comes into play. We all have different skin concerns from pigmentation, redness or bruising which all need different types of colour correctors to disguise the evidence. Fortunately, there is a wide range of correctors which can hide everything from redness to pigmentation all without caking on a tonne of the foundation. Although makeup artists have used colour correctors for year social media and the popularity of having a beat face has made it mainstream. Unlike regular concealers, colour correctors come in a wide range of colours and each shade addresses a specific issue. 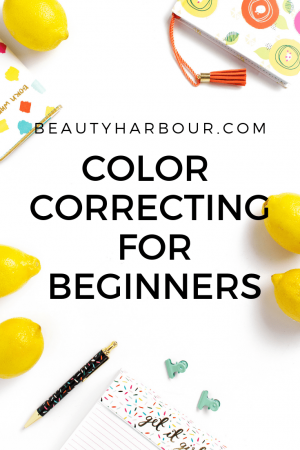 If you want to learn more about how to use the different shades and types of colour correctors this is the post for you. 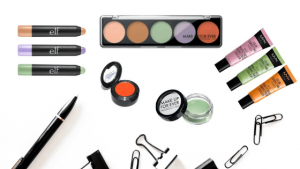 What is a colour corrector? Colour correctors are ‘’coloured ‘’ concealers designed to hide skin imperfections by utilizing the colour wheel principles. They are suited for hiding discolourations which cannot be managed by regular skin coloured concealers and are designed to hide skin imperfections like redness, sallowness and general discolouration. To understand how to choose the right colour correctors for your specific skin challenge you need to understand the principle behind the colour wheel. 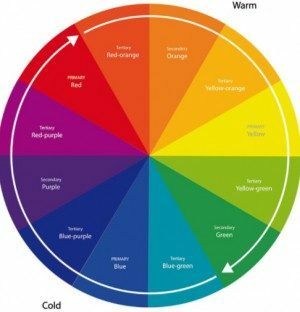 Colours on opposite sides of the colour wheel neutralize each other when mixed together. So depending on the colour of your blemish, looking at the colour wheel and identifying which colour is on the opposite side of the wheel determines what colour concealer will be most effective. Apart from colour consistency and intensity of the shade is important and varies by skin tone. For extreme discolouration products with a more intense hue is needed, while moderate discolouration requires a sheerer formula. In addition, people with darker skins require darker colours while fairer skin works better with sheer formulas. Because we don’t all have colour wheels in our handbags tucked away for easy reference, let’s have a chat on the different types of coloured concealer’s. Since green is the opposite of red on the colour wheel, it works best to cover and neutralize redness. So if you have active rosacea or active angry acne you should be reaching for a green corrector.G reen correctors come in different shades and range from light mint green to dark green. The intensity of the shade best suited for you depends on your skin tone and shade warm or cool. People with richer complexions need to be more careful when using colours like green because if not properly blended can end up emphasising the blemish. As with all concealers it should be used sparingly and only on the areas it is needed. Yellow is directly opposite purple and blues, making it the perfect choice disguise bluish-purple under eye circles. It also corrects mild pink and redness such as such as broken capillaries and is effective for cancelling out hyperpigmentation and generalized redness. So can be extremely helpful if you for a more generalized spotty complexion. Since yellow is opposite green on the colour wheel, they are used in areas which are veiny and green. They can also be used as general skin brighteners when used under foundation to even out skin tone. Pink correctors, on the other hand, correct yellow and mild green discolouration and can brightening overly olive, sallow skin. They are also helpful if you want to conceal combat dark under eye circles or dark shadows around your mouth. Because they have a less intense colour, pink concealers are better suited for people with fairer skin whose veins are more likely to show through. For dark skin tones, orange-red and apricot tones are able to neutralise most complexion issues including dark spots and under eye circles. Red, in particular, is able to neutralize green or blue so is perfect for under eye circles and areas with prominent veins. 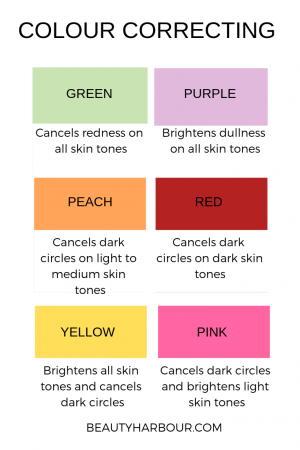 As always the intensity of the shade you chose depends on your skin tone so the darker your skin tone the darker the peach or red you need to choose. Purple is the opposite of yellow on the colour chart so cancels out yellow undertones giving skin a healthy appearance. They also correct dark spots and hyperpigmentation and can be mixed with a primer prior to applying foundation. These are best are used as a highlighter and can be mixed with coloured concealers to sheer them out as needed for a more natural finish. I personally prefer to apply colour correctors directly onto clean skin before I apply my foundation. This allows me to buff it into my skin properly. Doing this also allows me to use the least amount of product because it lets me know exactly how much product to use. Here are are some points to consider when choosing what type of colour corrector to use. Choose the right colour based on the type of blemish you want to conceal. Apply the concealer on the blemished area alone. Colour correctors range in price from low to high end for light to dark skin tones. So there is enough variation to fit multiple budget ranges and here are some recommendations below. I tend to reach for the MAC Studio Finish Skin Corrector Pure Orange colour (i am NC 50 ) and because it is extremely emollient and blends in easily. Which of these colour correctors have you tried and which do you plan to try? do you prefer correctors in a wand or a pot? let me know in the comments.